A detective themed mystery party for all girls - ages 12+ for 7-12 guests! Get ready to do some serious sleuthing and have a blast solving a fun and challenging mystery at River Peak High School! This is the instant download upon purchase, nothing needs to be shipped, so you avoid shipping fees and don't have to wait. Everything needed to play is included in the game file. For the boxed set, click the link below to have us prepare your kit, under Helpful Links. *For the younger aged guests (10-12 years), parent hosts might need to give assistance with clues and sleuthing! Note: this game was updated on 2/2/18. If you've purchased the game license within the last year, you may download the newest version from your account. Mancy received word from the local police about a diamond heist at Hemsberg Diamonds Jewelry Store in the town of River Peak. The Zamkiki Diamond is the fourth largest diamond in the world, and was on display at Hemsberg Diamonds until jewel thieves broke into the store and stole it from the case! The River Peak Forensic Science Club has agreed to assist the police in the investigation since there was evidence of the thieves having ties to River Peak High! The club members are set to meet at Hemsberg Diamonds Jewelry Store. Mancy will brief the group upon arrival, but she also has a few stress-relieving games planned to break up the meeting. As Mancy says - relaxed sleuths are effective investigators! Rumor has it there may be codes to break and riddles to solve before the jewel thief can be found. This is where your story begins. 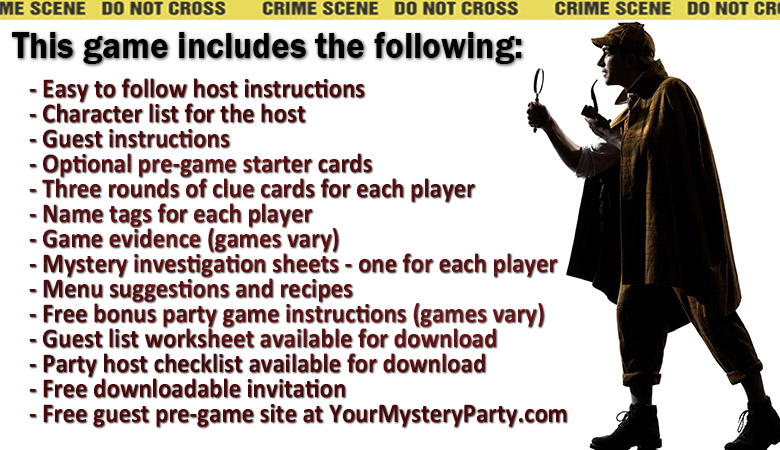 In addition to the fun mystery game, there are free add-on optional bonus games from The Official Party Host Handbook.